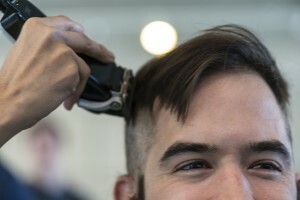 A “shavee” at Rush’s 2013 event to raise money for pediatric cancer research. The 2014 event is scheduled for Feb. 28. In the United States, a child under the age of 20 is diagnosed with cancer every three minutes. So in the time it takes to read this piece, a family will be faced with the very real possibility of losing their child, as there are many cancers where progress towards a cure is still very limited. And even those that are cured of their cancer, their battle continues with chronic health problems or other life-threatening conditions. While the government and foundations continue to invest in adult cancer research, childhood cancers are left to fend for themselves. In fact, all types of childhood cancers receive only 4 percent of the total U.S. federal funding for cancer research, with pharmaceutical companies investing even less. So the question becomes if not us, then who? If not now, then when? Should we wait until more children are stripped of the opportunity to go to school or fall in love? Or ask more parents to stay strong while their children go through grueling treatments or are lost altogether? This is where St. Baldrick’s comes into play. Through the help of dedicated physicians, such as Dr. Paul Kent, students, families, friends, patients and survivors, we seek to close the funding gap. Through events across the country, with head shaving being the premier event, over $30 million was raised in 2013. Joseph Lee is a third-year med student at Rush Medical College and PR-co chair of the St. Baldrick’s Fundraiser at Rush Children’s Hospital. The head-shaving event at Rush is scheduled for Feb. 28. Learn more and contribute at www.stbaldricks.org. This entry was posted in Cancer, Children and tagged cancer, med school, pediatric cancer, St. Baldrick's. Bookmark the permalink.